王雷, 杜媛鲲, 米源, 廖海江, 陈阁, 张耀中, 刘庆熠. Hedgehog/Gli和PI3K/AKT信号通路的串话促进胃癌AZ521细胞上皮-间质转化[J]. 中国医科大学学报, 2018, 47(2): 151-156. WANG Lei, DU Yuankun, MI Yuan, LIAO Haijiang, CHEN Ge, ZHANG Yaozhong, LIU Qingyi. Crosstalk of Hedgehog/Gli and PI3k/Akt Pathway Promotes Epithelial-mesenchymal Transition in Gastric Adenocarcinoma[J]. Journal of China Medical University, 2018, 47(2): 151-156. Abstract: Objective To investigate the tumor molecular mechanism of Hedgehog/Gli in promoting the epithelial-mesenchymal transition (EMT) in gastric cancer AZ521 cells.Methods After 24 h of treatment with GANT61, the mRNA expression of Gli1, Gli2, N-cadherin, and E-cadherin in the AZ521 cell line were detected by real-time fluorescence quantitative PCR. A Western blotting assay was conducted to determine the expression of the above cytokines, p-AKT and AKT. The effect of GANT61 on invasion was observed by transwell assay. 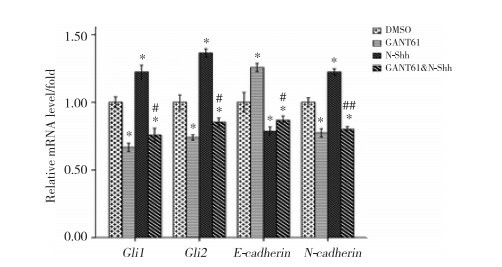 N-Shh stimulation of the Hedgehog pathway was conducted to confirm the changes in these cytokines.Results GANT61 significantly downregulated the mRNA expression of Gli1, Gli2, and N-cadherin, but upregulated E-cadherin mRNA expression. The Western blotting assay revealed that GANT61 downregulated the protein expression of Gli1, Gli2, p-AKT, and N-cadherin, but upregulated E-cadherin expression. Furthermore, GANT61 inhibited the invasion. N-Shh proteins up-regulated Gli1, Gli2, and N-cadherin mRNA, protein expression and p-AKT protein expression, but downregulated E-cadherin mRNA and protein expressions. N-Shh promoted the invasion of tumor cells.Conclusion Downregulation of Gli1 and Gli2 can inhibit the invasion and metastasis in gastric cancer cells, which may be related to the promotion of EMT by Gli through the PI3K/AKT pathway. SUNG WJ, PARK KS, KWAK SG, et al. Epithelial-mesenchymal transition in patients of pulmonary adenocarcinoma:correlation with cancer stem cell markers and prognosis[J]. Int J Clin Exp Pathol, 2015, 8(8): 8997-9009. ATTRAMADAL CG, KUMAR S, BOYSEN ME, et al. Tumor budding, emt and cancer stem cells in T1-2/N0 oral squamous cell carcinomas[J]. Anticancer Res, 2015, 35(11): 6111-6120.